Almost gone from popular consciousness was his tear through the featherweight division, his unheard-of eighteen fight win streak, his brutalization of WEC champ Uriah Faber (pictures of Faber’s horrifically bruised legs, mangled by the kicks of Aldo, had gone viral after their fight). Instead, it seemed Aldo would only be remembered as the mute foil to Conor McGregor; his flash-knockout loss to the Irishman just seconds into the first round of their fight at UFC 194 only took up a few moments of Conor’s highlight reel. The story of a young boy with a scarred face who had lifted himself out of the poverty and violence of the slums of Manaus, Brazil with the power of his fists and the thud of his leg-kicks would be forgotten. But on Saturday night, Aldo added a new chapter to his story. Stepping into the cage at the Scotiabank Saddledome in Alberta, Canada against the ferocious brawler Jeremy Stephens, the popular wisdom was that Aldo would have to stick to a strict game plan. 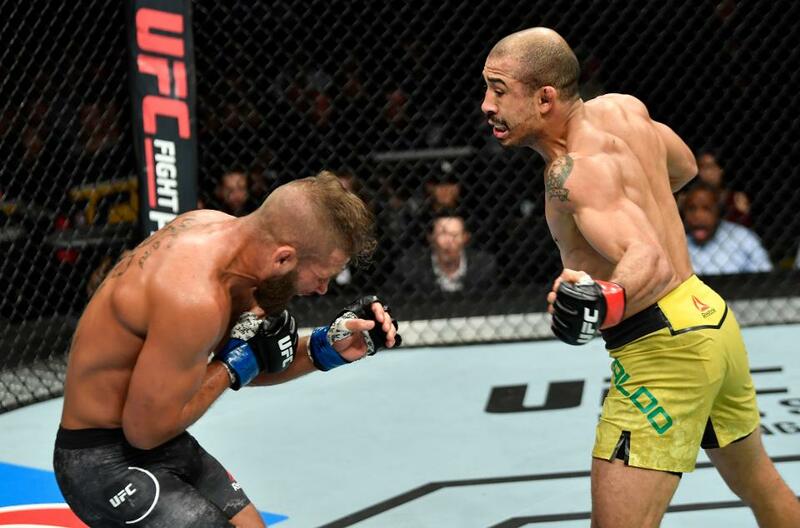 To give into the temptation to bite down on his mouthpiece and trade blows with the heavy-handed American would surely result in Aldo being pummeled into unconsciousness. Instead, Aldo would have to fight conservatively, a leg kick here, a jab there, a matador to the bullish Stephens. Midway through a sparse first round, Stephens countered one of Aldo’s signature leg kicks with his own right hand, catching Aldo on one foot. The Brazilian appeared to be hurt, staggering back against the fence and desperately weaving to avoid the onslaught of punches as Stephens swarmed in, smelling blood. Aldo attempted to initiate a clinch, desperate for any port in a storm, but Stephens shrugged him off. The end seemed to be near. In that moment, Aldo decided to take the bait. Some animal anger took hold, and he did exactly what his cornermen were screaming for him not to do, bit down on his mouth piece, and charged back swinging into the punches of the heavy-handed Stephens. It worked. Stephens backed off. Aldo took a few deep breaths, safe for a moment. A more composed fighter might have backed off here, and resumed his conservative game plan. Certainly Aldo in his earlier days would have been so inclined. The Brazilian was always hard to get a rise out of, almost impossible to convince to engage on terms other than his own. That had changed now. Aldo, the old lion now cornered and injured, roared back at Stephens, and jumped into the sort of slug-fest trade war that a fighter like Stephens seemed built to win. Aldo’s fans winced. Conventional wisdom would tell you that Aldo would be foolish to stand toe-to-toe with Stephens, and yet that is exactly what he did. The bullfighter going head to head with the bull. Aldo should have been knocked dead, but somehow he began to land. One punch and then another. Stephens’ face split into a snarl. This wasn’t how it was supposed to go. Bloodied now and furious, he charged back at Aldo and was clipped with a crisp left hand. Confused, he dropped his hands momentarily to reset and breathe, and Aldo stepped in again and landed a right and then a left hand that appeared to deflected right off of Stephens’ solar plexus. Stephens grimaced, the death-row smile of a fighter desperately trying to hide that he’s been hurt, and collapsed, rolling onto his back in a semblance of a guard. Aldo pounced, raining ground and pound. Stephens turned his back to Aldo, and for a second you could see Aldo considering sinking in his hooks to take his back, an instinct no doubt hardwired in the former Brazilian Jiu Jitsu champion. But no. Attempting a submission would give Stephens a chance to recover. Eschewing grappling, Aldo began to rain down hammer-fists. Within a few moments the fight had been stopped. Here was redemption for Aldo, a former contender for the title of Greatest of All Time but a loser via knockout in three of his last four fights. A loss to Stephens could have been the final nail his career’s coffin, but here he was, raised up onto his corner-men’s shoulders, bawling with his hands over his eyes as a still-stunned Stephens argued with the ref over what would be hard to call an early stoppage. Now there was a path visible to redemption in the form a rematch with Conor Mcgregor. A new Jose Aldo had arrived, older and angrier and more ferocious than his earlier self. Still, a question seemed to hang in the air over the octagon. In MMA, there has always been the phenomenon of the fighter who, having tasted the sweet waters of the TKO, becomes mesmerized by the power of his own hands. Like the Greek myth of Narcissus he lets all of the other aspects of his game desiccate as he chases swinging after the knockout. The Frank Mir Disease, you might call it, where a once technical fighter devolves into a wild-swinging brawler and eventually comes back on his shield, having finally encountered a brawler who brawls better that he does. Would Aldo give in to temptation? Or would he temper his new-found power with his characteristic conservatism and restraint. A renewed Jose Aldo, with new confidence in his hands and boxing chops could be a deadly admixture in the Featherweight division. However, Conor McGregor had already demonstrated to the world that an angry and reckless Aldo was an Aldo that could be defeated, that could find himself waking up from an impromptu nap on the Octagon canvas on live TV in front of millions. Surely his trainers would do their best to encourage him to remain restrained and not be overwhelmed by the impulse to stand and bang, but when the cage door closed behind him, there would be little they could do to keep Aldo from giving in to fury. Next Was the McGregor Brawl Good for MMA? I would add that the finishing sequence ended with a second liver shot on the ground. Otherwise, a solid write up that captures the grandeur of the situation.